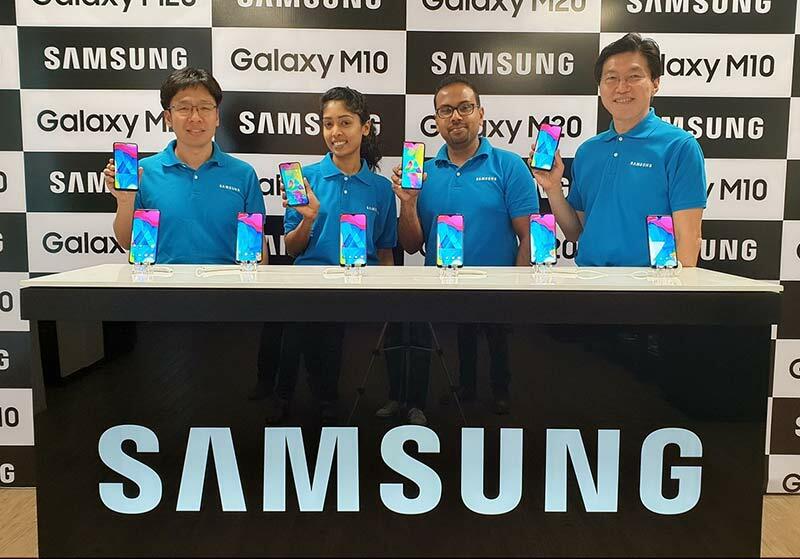 Samsung Sri Lanka today launched Galaxy M20 and Galaxy M10 smartphones that have been designed ground up in the country for young millennials. Galaxy M series smartphones come with best-in-class infinity-V display and powerful features such as dual camera with ultra-wide lens, long lasting battery, high performance processors and a new Samsung Experience UX. “Galaxy M smartphones are powerful and stylish, and have been designed to cater to the aspirations of today’s tech savvy millennials. With these new devices, we have dialled up a really powerful experience in every dimension. Today’s millennials want a smartphone that is lightning fast, runs longer and comes loaded with latest innovations. Meaningful innovation and customer-centric approach form a part of our very DNA and the new Galaxy M series is an embodiment of that commitment,” said Shantha Fernando – General Manager and Head of Mobile Biz, Samsung Sri Lanka. “Samsung is a trusted brand, providing customers with aspirational, great quality smartphones. The Samsung Galaxy M series will resonate well with tech savvy millennials seeking powerful devices. With this launch, we continue to build a strong portfolio in the smartphone category providing customers with a vast selection across price points,” said Thushara Rathnaweera – Product Manager, Mobile Biz, Samsung Sri Lanka. Galaxy M series is a testimony to Samsung’s deep commitment to the initiative that focuses on creating products and innovations to enhance the lives of local consumers. Galaxy M20 comes with a true FHD+ 6.3” FHD+ infinity-V display, while Galaxy M10 has a 6.2” HD+ infinity-V display ensuring truly immersive viewing experience. Both Galaxy M20 and M10 come with Widevine L1 certification for seamless streaming of HD content through popular apps. Galaxy M20 and Galaxy M10 will be available from 09th February onwards. Galaxy M20 and M10 will be available in Ocean Blue and Charcoal Black colours. Galaxy M10 will be priced at Rs. 23,900 for the 2GB+16GB variant, while the 3GB+32GB variant will cost Rs. 27,390. Galaxy M20 is priced at Rs.33,900 for the 3GB+32GB while the 4GB+64GB is Rs.38,900. The Galaxy M20 and M10 will be available across all authorized partners of Samsung: Damro, JKOA, Softlogic, Singer and Singhagiri and across all authorized dealers and online partners islandwide.